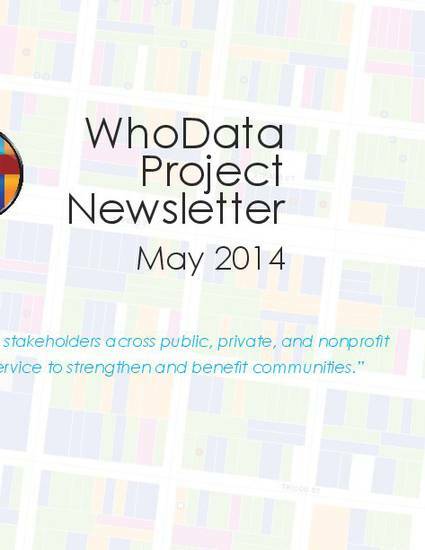 WhoData is a community action research and service program. Since 2009 the team of volunteers has provided organizations in New Orleans - LA, Boston - MA and Ithaca - NY with resources that aid in the recovery, renewal and/or redevelopment of communities. Since 1987, I have worked in a variety of roles and had opportunities to examine and participate in ways that academic, public, private and non-profit organizations have engaged in the neighborhood planning process. Some have been successful but others have not. As a result, the social and economic benefits that arise from collaboration, neighborhood knowledge and public policy have been mutually exclusive and, at times, directly undermine the goals of people and systems that otherwise should be compatible. (Thompson & Owens, 2012) In an effort to bring the ideas, talents and technologies together, a theory of “middle through” community engagement was named in 1996 as public participation geographic information systems (PPGIS) (J. Ferreira, 1998; R. Sieber 2006). The goal was simple – identify the shared vision and resources that would allow residents, their municipal leaders and the academic community to work collaboratively and synchronously. By incorporating local/neighborhood knowledge with public information then merge them into shared data systems, there would be a significant increase in residents communicating their desires, improve civic engagement, and further inform municipal leaders with a better understanding of community needs. By using PPGIS, residents would be empowered by increasing ready access to information and increase their ability to fully participate in a modern ‘ladder of citizen participation’ (Arnstein, 1969) by using contemporary technology, such as GIS, to meet these goals.